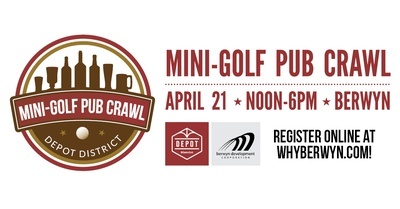 Grab your putter and 3 friends and tour the Depot District's repertoire of taverns and restaurants at the 16th Annual Depot District Mini-Golf Pub Crawl on Sat, Apr 21. Register online for $15 per person or $50 per foursome ($40 early bird special through April at noon). Sign-in from 11:00 AM to Noon at Connie's Family Restaurant and end-of-day "19th Hole" after-party with food begins at 5:00 PM - Perception Lounge. All participants must bring their own putters. Not able to get together a 4-some this year? That's ok! Come as an individual, meet your neighbors and make new friends! Each venue will display a handmade mini-golf green to challenge the event's spirited crowd! The event will tour Berwyn's Depot District and takes place rain or shine. Don't worry about the weather! Last but not least, prizes will be awarded for teams with the lowest - and highest - scores, best themed team, best decorated putter and the Twisted Putter Trophy will be awarded to the venue voted as having the best designed hole.This event is brought to you by the Special Events Commission of the Berwyn Development Corporation. ​Shotgun start at Noon at Connie's Family Restaurant. For Vendor and Sponsorship opportunities download PDF. To register online, click "Register Now". To send the form with payment by mail, download PDF.